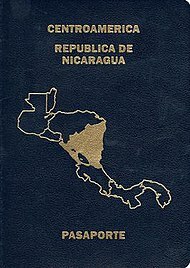 The front cover of a contemporary Nicaraguan passport. The Nicaraguan passport is issued to citizens of Nicaragua for international travel. As of 1 January 2017, Nicaraguan citizens had visa-free or visa on arrival access to 112 countries and territories, ranking the Nicaraguan passport 46th in terms of travel freedom (tied with Marshallese passport) according to the Henley visa restrictions index. The current Nicaraguan passport has 89 security features, including bidimensional barcodes, holograms, and watermarks, and is reportedly one of the least forgeable documents in the world. This Nicaragua-related article is a stub. You can help Wikipedia by expanding it. This page was last edited on 18 February 2018, at 10:54 (UTC).